Most of the time, Apple uniquely matches the surrounding architecture. The full glass store doesn’t seem to fit there. Looks like a parking garage with glass in front. It doesn’t fit at all. Not even close. It would’ve been awesome to see what Apple could’ve done with a shitload of New England red brick or some pink Connecticut quartz. I wish they’d done something innovative with this store, rather than just pluck the glass cube from NYC. That photo doesn’t do it justice. It looks awesome up close. At least it’s something new(ish) and different… Our ideas of architecture are so boring and conservative in Boston and the US in general. The real question isn’t if it’s an eyesore, it’s who will be in line with me at noon tomorrow? Or is that too late? Should I get there at 7AM? What should I bring? I have a portable hammock and of course my Macbook. I could bring an iPod and my recorder and my camera. But then how would I carry away the AIR that I’m sure to win? I totally disagree, trying to “fit in” architecturally requires zero amount of innovation. Making it stand out as separate, like modern buildings in Europe do, is much more interesting and respects the older buildings by not trying to copy them. I remember reading a story last year about this store coming and how they were all into making it fit the Boston vibe. Well it looks like the job was too difficult and they just fell back on the NYC store’s theme. Too bad, it could have been really intersting. Oh well, it will still make mountains of money. Very cool! Matches the NYC store nicely. Is definitely a stark contrast to the usual BackBay buildings, but think it will look like a tacky flashlight at night. Agree that Apple should have put some original design thought into this location, rather than just re-construct the NYC store. I’m sure the Back Bay historical commission is extremely unhappy with this particular decision. It looks like the biosphere project. I love Apple, but they whiffed on this one. thank god, not another red brick building! i think the scale and the massing fit right in and its refreshing to see a small-scale, glass structure in the city (even if apple does it all the time). i hope more modern architecture will break out of boston’s red brick box. First, I can’t believe you folks were surprised by the Apple Store’s look. This is consistent with other Apple retail locations. 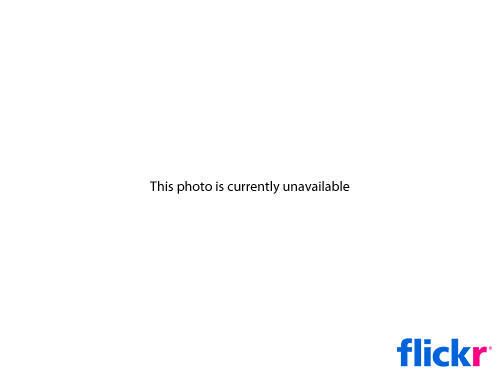 Anyone remotely acquainted with Apple’s brand should expect this kind of sleek, minimalist approach. Secondly, why do Bostonian’s insist on conventional structures, preferably those made of brick? Great cities everywhere have a mix of buildings that reflect the changing styles and attitudes of the times. They prove that there’s plenty of harmony between stone, glass, and metal structure of varying periods. This store will blend into the surrounding block just as well as the Hancock tower complimented Trinity Church. In fact, the Apple Store isn’t any more offensive than the cluster of buildings (the Prudential Center) that sit directly across from it. Be bold, Boston, and go against your instinct to despise the new. New England red brick? Pink Connecticut quartz? Apple? Are you kidding? It’s an Apple store – they do contemporary design. Just because everybody else here bows to the pressure and builds in masonry doesn’t mean a design firm (which Apple is) should ignore their own identity. I’m very happy Apple managed to finally get a 21st century building built in the Back Bay. You can’t judge this just by the fact that it’s glass, or from one picture taken before they’ve even taken the covering off the ground floor glass. The building looks nice from the photo. Not everything in Boston is red brick, not even in that neighborhood. (Not sure why people think all the modern buildings here are all brick-faced or that they have to be.) The point is to achieve a scale + design that makes sense with the surroundings which Apple has done successfully judging from the photos. The fact that you can see the reflections of the other buildings is also very nice. We just got back from dinner down on Newbury Street. Nobody is saying that it had to be red brick — and the surrounding buildings are not red brick either, so I don’t see how some of you are drawing such conclusions. Oh and it is entirely possible to blend modern architecture with those buildings and it does require a fair deal of innovation to do so (cough cough Sean cough cough). In all honesty, this store just looks like the NYC store transplanted. It’s rather tacky as it is. 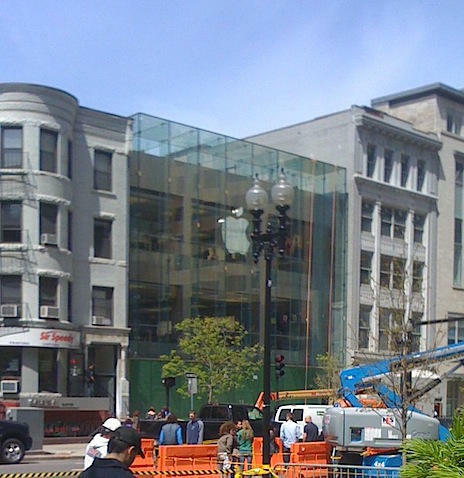 Here are a few shots of “opening day” the Apple Store on Boylston Street. We were quite impressed with the energy of the staff and crowd. The central staircase is simply stunning. A great addition to Boston.